The PM-1 encompasses mahogany’s charms so well, and Fender’s “earthy and organic” claim is actually very accurate in sound and vision. A great example of an affordable solid-wood mahogany dread’ with plenty of character. We’d like to see what it can offer with an electro option. When Fender launched the Paramount series last year, it represented a new commitment to winning over players from a company that’s arguably not traditionally a go-to for acoustics. With its Standard and Deluxe ranges, a two-year development paid dividends and we were suitably impressed with the PM-2 Deluxe parlor, PM-1 dreadnought and PM-3 000 Standards. Fender was establishing itself in the lower market area with characterful models boasting solid backs and sides, which also came stage-ready with individually voiced preamps for each shape - the result of a Fishman/Fender collaboration. The Paramount Standards offered serious spec for the money, and now with its next wave of models, Fender moves from spruce/mahogany to add all-mahogany construction to the range. But that’s not the only fundamental change… Curiously, these new Standard models are not equipped with Paramount preamps. The original spruce-topped electros have gone up to £599, but it’s puzzling that these new models don’t have preamp-fitted model options, too. Nevertheless, their look is anything but disappointing. The mahogany tops have an indented texture to the grain that looks and feels vintage; a thin ‘open-pore’ satin finish leaves their organic looks unhindered. While we’re encountering more guitars in this price territory that aim for vintage Americana-style heritage, these models set a new standard for their price range. The narrower 60s-inspired headstock, open gear tuners and Fender logo and motif all set the tone, but the checkerboard purfling for the top, rosette and back strip takes on influence from further back in time and recalls the old Weissenborn Style 4 rope binding. It really gives these models a premium vintage touch, and it’s even more effective set against the dark mahogany than the original launch models. With such a strong cosmetic show, we’re just left with a small bugbear: the only feature disrupting the vibe here is the white nut. An ivory tone to match the binding would’ve better served the flow of the design. But the advantage is, it’s real bone. This is a lightweight guitar, too, especially for solid back and sides builds. The PM-2 is actually neck-heavy when standing with it on the strap. For the heavy-handed among us, that might give pause for thought, but the weights feel welcoming and accessible here, with the satin ‘open pore’ necks soon beckoning. And in play, there’s the sense that it all adds to the appealing sonic qualities of this guitar. In many respects, the PM-1 is a textbook example of an all-mahogany dreadnought boasting a lot of the character that attracts players to this wood choice, but it feels notably livelier than some we’ve encountered. 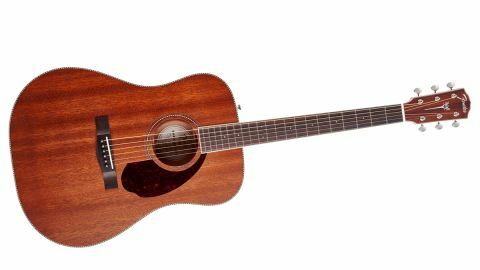 Compared with our Martin D-15-styled solid-mahogany Sigma, for example, the Fender’s lighter weight seems to aid an airer tonality without losing muscular projection. That mahogany mid voice is there in abundance with a thumpy and defined low-end, rather than the boom that we’d hope to find from mahogany. Sustaining notes shine in the upper-mids with a pleasing, rounded bluegrass quality playing with a pick. For flatpickers and those pursuing a woodier tonality, rather than steely chime, look no further. Fender’s latest addition proves it’s on the right track with the Paramount series. If you’re looking around the £500 end of the market, this is a must-try. It feels and sounds well considered, offering its own angle on mahogany appeal. We would’ve liked to see the Paramount preamp offered, at least as an option - widening the potential appeal this design deserves - but as it stands, this is a solid-wood acoustic with a quality hard case. A compelling sell.